Before I had weight loss surgery, the keto diet was the very last diet I tried. I calculated my carbs and fats and avoided grains and sugar like the plague. I said no to fruits and drank plenty of water. After three weeks, I lost a total of zero pounds. I called myself a failure and tried to accept the fact that I’d be overweight forever because apparently, I could not lose weight. Thankfully I didn’t give up on myself and I decided to consult a nutritionist and a bariatric physician. After a few tests, my problem was obvious. I wasn’t a failure. I had insulin resistance also known as metabolic syndrome also known as Syndrome X. In other words, my body was working in a way that made it difficult to lose weight. Weight loss surgery totally transformed those impossibilities into possibilities because I’ve lost a total of 95 pounds so far. And I’m in a healthy weight range. Since I want to keep it that way, I try to stick to a high protein, low carb, moderate fat diet. Keto recipes are perfect for me so I’ve found myself making more and more keto friendly foods. This cauliflower dish is one of them. Hey, there cauliflower. You never looked so good! Place the cauliflower in a steamer basket on top of a pot with boiling water and steam until fork-tender, around 6-7 minutes (can also cook in the microwave if a steam basket is not available). Remove from heat and transfer cauliflower into a cold water bath to prevent further cooking. Drain well and pat dry. Transfer steamed cauliflower to a large bowl and add cream cheese, heavy cream, butter, garlic powder, and dried dill. Season with salt and black pepper, to taste, and toss to combine. Transfer to oven-safe casserole dish and top with shredded cheese blend and crumbled bacon. Place in preheated oven and roast until cheese is melted and nicely browned on top, around 8-10 minutes. 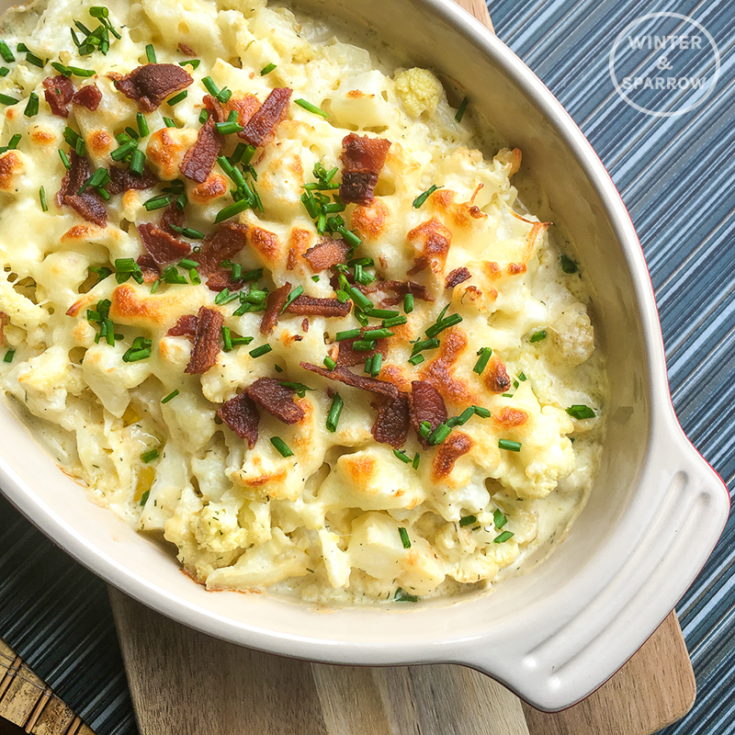 Remove from oven and serve that delicious keto cauliflower topped with fresh chives. Remember how much you hated cauliflower as a kid? Not anymore. Not with this dish. 1. Place top oven rack in the center position and preheat oven to 400°F. 2. Place the cauliflower in a steamer basket on top of a pot with boiling water and steam until fork-tender, around 6-7 minutes. Remove from heat and transfer cauliflower into a cold water bath to prevent further cooking. Drain well and pat dry. 3. Transfer steamed cauliflower to a large bowl and add cream cheese, heavy cream, butter, garlic powder, and dried dill. Season with salt and black pepper, to taste, and toss to combine. Are you currently on the keto diet? If so, what type of recipes would you like me to share? Oooooo! I LOVE cauliflower & did a double take while scrolling. This looks awesome! Bookmarking this to make soon! !